After a traditional dental exam has verified the health of all underlying structures, the dentist begins a smile analysis, using facial measurement formulae relating teeth to the face and other techniques to customize the appropriate sized teeth to each specific individual. 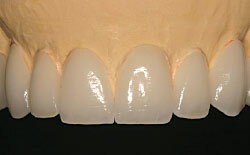 A computer imaging process is used to digitally replicate the patient's smile and then fabricate a mock-up smile made of tooth-colored (white) wax [Fig. 7]. This is used to make the provisional teeth after the diagnostic visit. Provisional teeth are often used and are a benefit to patients because they can be worn for up to two weeks, creating, in effect, a “trial smile” — one of the rare instances in medicine or surgery where we can view and evaluate changes before the final result. The provisional stage gives patients the exciting prospect of becoming full partners with their dentist in choosing from available colors and shapes. Patients interact with their dentists through feedback and information before deciding upon the final restorations that a gifted technician will exactly replicate in the porcelain veneers. value, the relative darkness or lightness of the hue. However, when looked at three-dimensionally, teeth have a variety of these combinations. When changing people's smiles, the patient has a choice of matching their existing tooth color known as “Natural Color.” Patients can enhance their tooth color in two more ways; a much brighter “Enhanced White” color; or, like some celebrities, a dazzling version known as a “Hollywood White” color. Each of these colors usually has the same chroma and hue chosen by the dentist and the laboratory technician. The difference between these three enhanced smiles is the value of that chroma [Fig. 8, 9, 10, 11 and 12]. With the different shade guides that are created by the porcelain companies, the dentist or the lab technician can blend the shade and color that best represents the patient's expectations [Fig. 13]. The technician will choose several different colors and textures to mimic an existing tooth color or create a new brilliant color that the patient and the doctor have agreed on. Since most of the tooth is still remaining after preparation, the veneer will act like a “contact lens” and transmit the original color of the tooth, and then be enhanced with the colors the technician baked into the porcelain.